Pub near Ealing Common Station. 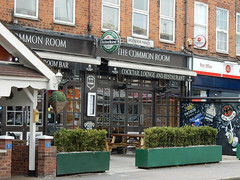 It has a single large, open room with some large tables along one wall, and smaller ones filling in the space, in what is a fairly modern pub/bar space. Carpet ensures that it retains some cosiness, and pillars block some tables' view of the large wall-mounted screen showing sports at one end of the bar (there's another smaller one near the front window as well). There's a seating area out the front too, with retractable awnings and heating to keep the smokers warm and dry bad weather (however when the weather is more clement, this area's open to the elements). On a cold Saturday afternoon in November 2008, the place was quite full with people loudly watching a rugby match (New Zealand supporters mostly, it seems), but there were still plenty of tables away from the screen-fixated crowds. The bar has a range of largely European lagers; as of November 2008 these included Leffe (£2.80/half), Pilsner Urquell (£3.75/pint), Peroni (£3.95), Amstel (£3.25) and others. They also had London Pride (£3.50/pint), but on tap rather than handpull. In March 2010 there was actual real ale available; Rebellion IPA from a small portable cask (£1.70/half, served in a half-to-line glass), as well as Stowford Press Cider. There's a none-too-extensive menu of pub basics, making this a decent, friendly, middle-market suburban pub. Accessibility: No steps to get in, and level access to the bar, seating, and toilets once you're in. Last visited by Kake, March 2010. Last edited 2015-08-14 15:19:54 (version 6; diff). List all versions. Page last edited 2015-08-14 15:19:54 (version 6).